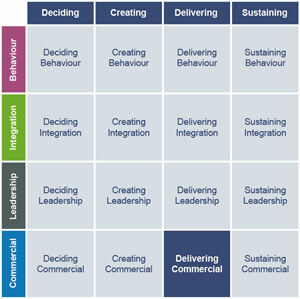 This page explains the 'Delivering commercial' cell of the Alliancing Code of Practice grid. This grid helps to understand who needs to do what, at what stage, for a successful infrastructure alliance. An effective early earning process provides a shared approach to early identification of performance issues and a collective approach to mitigation. Teams are able to follow a clear, single, integrated governance route for projects, with clear approval stages for partners, the alliance and the owner/client. Risk and reward mechanisms have been established and are supported by clear and visible processes. Projects utilise a common risk management process that provides integrated delivery teams with a single approach to risk identification, valuation and mitigation. Clear risk definitions are agreed and in place, including the difference between business and project risk. Project estimating and cost forecasting processes provide a common view of the current value of risk. The risk management process includes a common, and regularly updated risk mitigation plan, with risk ownership allocated to the appropriate part of the integrated team. Joint delivery teams are supported by a clear definition of costs that won’t be admissible under the contract. In an alliance contract this is likely to be limited to professional incompetence, repeated rework or to costs submitted outside project closure. The alliance leadership team (or Board) has taken responsibility for reviewing the behaviours created by the commercial model and are able to promote any required changes accordingly. Maintaining the link between the commercial model and the required behaviours is an important responsibility for the leadership group. The effectiveness of the commercial model is a collective responsibility – not something undertaken separately by the client. A joint partner commercial group or forum is in place and is focused on maintaining consistent application of the commercial model and alignment with partner home organisations. The commercial model is understood by all delivery teams, who have a clear understanding of the performance required to deliver commercial targets. The process for setting commercial thresholds and target costs is clear and visible to all of the alliance teams. A common estimating process has been established, which ensures respective partner costs can be integrated into a common project cost breakdown. This process delivers a single integrated project estimate - not an overall estimate arrived at by aggregating separate partner elements. Responsibility for integration of the extended supply chain has been defined within the management team. Where cost baselines are sufficiently understood the commercial strategy for the extended supply chain is based on the same principles as the alliance commercial model (incentivised and / or gain share arrangements). A consistent supply chain engagement process has been established; ensuring that the supply chain sees a consistent and equitable approach across all aspects of procurement. There is a clear process for providing delivery teams with visibility of work that supports effective planning. Visibility is provided prior to projects being passed to the alliance, not simply as part of the delivery process. Extended supply chain partners have been engaged at an early stage to harness their capability and secure their input into the programme and project delivery strategy.